The Annual Meeting of Postgraduates in Reception of the Ancient World is in need of a host for its fifth meeting in 2015. The 2014 AMPRAW was held at Senate House, University of London, and featured delegates from the United States, Spain, Greece, Germany, France, and all over the United Kingdom. Previous AMPRAW conferences have been held at Exeter, Birmingham, and UCL, and have all attracted high quality guest speakers and keynote papers. In order to ensure that AMPRAW 2015 carries on this high standard we are launching a competitive call for applicants to host next year’s meeting. Any group of postgraduate students is encouraged to apply for consideration to the AMPRAW2014 committee (ampraw2014@gmail.com). To apply, we would appreciate a short description of the institution where you intend to host the conference, a list of your founding committee members, possible theme(s) and directions in which you would take AMPRAW, alongside any other information that you deme relevant. Please send your proposal of no more than one page to us via email. The deadline for applications is the 31st of January 2015. We look forward to reading your applications. Please don’t hesitate to contact the committee with any questions. AMPRAW 2014 Registration Now Open! The AMPRAW 2014 committee is delighted to announce that registration for the fourth Annual Meeting of Postgraduates in the Reception of the Ancient World (AMPRAW) is now open! AMPRAW 2014 is a two-day conference that aims to provide both UK and international postgraduate students from all disciplines with the opportunity to present their research to the growing academic community working on the reception of the classical world in both ancient and modern cultural contexts. The focus of AMPRAW 2014 is the notion of authenticity in the reception of the ancient world. This topic addresses some of the most immediate issues arising from the increasingly influential role of academia in the creation of products of classical reception. The focus on authenticity offers a rare chance for postgraduates working in diverse areas of research in classical studies to contribute a variety of perspectives on one topic, enhancing their understanding of the ways in which questions of authenticity pervade different areas of scholarship. Conference delegates will also have the opportunity to socialise at a wine reception sponsored by the Ludwig Boltzmann Institute for Neo-Latin Studies, followed by the conference dinner on the evening of 25 November. Please register at the UCL Online Store here. Click on ‘Conferences and Events’, then click on ‘Greek and Latin’ under the ‘Arts and Humanities’ menu for the registration page. Only a limited number of spaces are available, therefore you are advised to register as soon as possible. The registration fee is £25 for both days, and includes lunches, refreshment breaks, and the wine reception, as well as admission to all panels and other activities on the programme. All delegates are encouraged to attend the conference dinner on Monday evening. Further information will be available in due course. AMPRAW 2014 is generously supported by the A.G. Leventis Foundation, the Classical Association, the Institute of Classical Studies, the Ludwig Boltzmann Institute for Neo-Latin Studies, the Royal Holloway Alumni Fund, the Society for the Promotion of Hellenic Studies, and the UCL Joint Faculty Institute of Graduate Studies (JFIGS). With the support of the Classical Association, we are able to offer 5 postgraduate bursaries for the Annual Meeting of Postgraduates in Reception of the Ancient World (AMPRAW), to take place 24-25 November 2014 at Senate House, University of London. Each bursary will be valued up to £100 and will cover the conference registration fee, as well as provide a contribution towards subsistence, travel costs, and/or accommodation. We expect demand to surpass the number of bursaries available. Priority will be given to delegates who are presenting papers at the conference, will encounter considerable transport expenses in order to attend, and who do not have access to other sources of funding, although all are welcome to apply. If you would like to be considered for a bursary, please send an email to ampraw2014@gmail.com with ‘CA Bursary Application’ in the subject line by 5 November. 1. A statement (300 words maximum) of why you are attending the conference and how AMPRAW 2014 relates to your research. 2. A list of other funding sources to which you have applied, both successful and pending. Outcomes of bursary applications will be sent out via email by 10 November. Bursaries will be distributed following the conference, upon presentation of receipts. Conference registration will open on 31 October. An email with a link to the registration page, and a copy of the final conference programme, will be sent out on this date. If you have any questions, please contact us at ampraw2014@gmail.com. Also visit our website at ampraw2014.wordpress.com or watch our twitter page (@AMPRAW2014) for updates as the conference approaches. AMPRAW 2014 is generally supported by the A.G. Leventis Foundation, the Classical Association, the Institute of Classical Studies, the Society for the Promotion of Hellenic Studies, the Ludwig Boltzmann Institute for Neo-Latin Studies, the Royal Holloway Alumni Fund, and the UCL Joint Faculty Institute of Graduate Studies (JFIGS). We were thrilled with the number of abstracts received for AMPRAW 2014, and have now contacted everyone who submitted an abstract notifying them of the outcome. In order to accommodate as many people as possible, we will be running parallel sessions at AMPRAW 2014. We look forward to a fabulous conference, and will be posting the conference programme and opening registration later this month. AMPRAW 2014 will be a very international conference, with speakers coming from as far as France, Spain, Germany, and Greece. Unfortunately we are unable to organise accommodation for delegates, but we are happy to say that our venue can assist with this. Please visit the Senate House accommodation webpage for more information: http://www.senatehouseevents.co.uk/additional-services/accommodation. In addition, there are a number of very affordable youth hostels in the local Bloomsbury and Kings Cross area. We wish all delegates the best of luck organising accommodation and transport, and look forward to seeing everyone in November. We have good news for those of you who accidentally missed our CFP deadline! We understand that this is a busy time of year and are willing to accept abstracts until mid-September. Please send your abstract to ampraw2014[at]gmail[dot]com by September 14. After this date the programme will be finalised and unfortunately no further late submissions will be accepted. Thank you to those of you who have already submitted abstracts. Today is your last day to submit an abstract for AMPRAW 2014. Please remember to email your abstracts (preferably as a .doc or .pdf attachment) to ampraw2014[at]gmail[dot]com. We welcome papers from all postgraduate students and newly graduated PhD students on the topic of ‘authenticity’ as it relates to the reception of the ancient world. AMPRAW2014 promises to be an exceptional event, with a number of interesting papers. Delegates will be joined by keynote speaker Dr. Nick Lowe, and guest speakers Professor Mary-Kay Gamel and Geraldine McCaughrean. The event will also include a roundtable, which will bring together academics and theatre practitioners to discuss issues of authenticity as they relate to the contemporary performance of ancient drama. We look forward to receiving your abstracts! We are now accepting abstracts! The AMPRAW 2014 Call For Papers was released this week and will be circulated widely over the next few months. You can read all the details about the theme of this year’s conference, where to send your abstract, and when you should expect a response, on our CFP page. We welcome applications from all departments and institutions. We hope there will be a number of bursaries available for delegates, and will provide further information about these when possible. Welcome to the AMPRAW 2014 WordPress! The Annual Meeting of Postgraduates in Reception of the Ancient World was established in 2011 and is now in its fourth year. The 2014 event will be held at Senate House, London, on November 24 and 25, and will revolve around the theme ‘authenticity’. A Call For Papers will be distributed shortly. 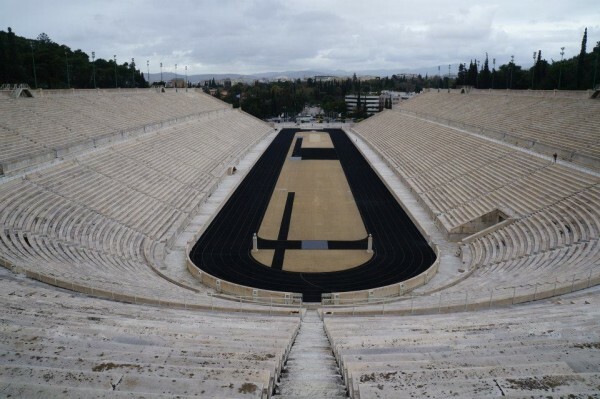 A reconstructed ancient stadium used as the athletics venue for the first modern Olympic games, as well as for the marathon finish and archery in the 2004 Athens Olympics.